Tangled and True: cosmic bebe. I've always loved fortune cookies and good horoscopes. While I don't necessarily believe them to be true, they are fun to read and I always do find myself looking to see if I relate in any way. When Cosmic Bebe was brought to my attention, I was highly intrigued. The designs were great, the shirts high quality, but I needed to put them to the ultimate test. My girls birthdays are 2 days apart, giving them the same sign, with night and day differences in personality I didn't think it was possible to cover both girls with one descriptive word. I had to laugh when I found their sign and the descriptive word was friendly. If ever there was one word that described them both it would be friendly and so Cosmic Bebe won me over with one simple word. You love them too? 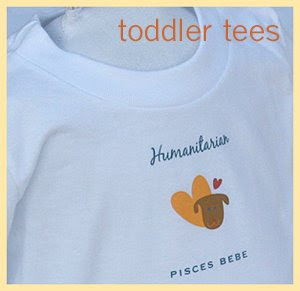 They have you covered, mommy tees, toddler tees, infant tees and coming soon... maternity tees. Find out your sign is here and see if your personality aligns with the stars.